New resident to San Diego about 2 years ago. Just after moving in I purchased a manila mango tree at the local home depot. Transplanted it to my hillside around September 2016. After doing some research last year I clipped off the top 6-7" with hopes of it branching out multiple stems. Success. Fast forward to a few months ago I notice new leaves coming out and fruit buds flowering (is that the correct term?). I notice insects starting to eat my leaves so last month I purchased Sevin insecticide spray and sprayed the trunk and leaves and it looks like the damage to the leaves have stopped and I haven't seen any bugs on the plant. Here are some pictures of the fruits starting to grow. It's on a hillside with loamy? type dirt so it's fairly fast draining and I've been watering it once every 2-3 days about 3-4 gallons of water per watering. Am I doing this right or can you offer any advice? I am in San Diego about 7-8 miles inland from the ocean. I'm not a mango expert, but your mango (flower) seems to suffer from powdery mildew. i'm sure other members will give you a better advice. Your watering schedule and how much to water really depends on your soil, the size of your tree and the time of year it is. During cold weather in Winter, especially if we get rains, I may not water my in ground trees for 1-2 months. Also as the canopy gets larger, there is more leaf surface area so you need more water compared to a small sapling. Your tree doesn’t look very big from the few pictures you posted. I would recommend removing the blooms so that your tree can grow a bit larger. Since your tree is blooming already, I recommend grafting it with a named cultivar. The Manilla mango seedling Fruit are not very good quality in my opinion. I’ve tasted fruit from many different Manilla Mango seedlings and I’ve only had one that was just ok with some fiber, nothing I would really buy at the supermarkets. Many people think they are planting the “Manilla” like the the Ataulfo/Champagne/Manilla from the supermarkets but the Manilla seedlings from HD and many of the other nurseries are just seedlings and the fruit tastes very different than the Manillas you buy at the supermarkets. The seedling Manilla Mangos often get Powdery Mildew on their blooms but once they get established, they still seem to produce fruit even if the PM were left unchecked. Lemon Zest is one of my all time favorite Mangos to eat but it gets a lot of Powdery Mildew on its blooms. It seems to fruit better when grafted onto Manilla rootstock but this is just from observation off my tree. Sweet Tart and CAC/COC would be good varieties to graft onto your tree. They are fairly disease resistant and set good crops in SoCal. Hey Simon, thanks for your advice and feedback. 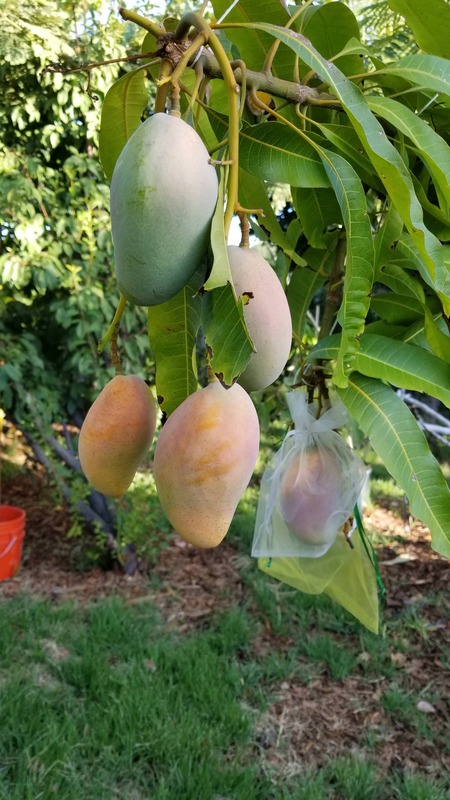 So I was able to get about 4-5 mangos from this tree this year. They are very stringy and you were pretty much dead on in regards to lack of quality. After closer look this is definitely a seedling and not a grafted tree. I just finished pruning the tree and will let it grow so I can graft a couple varieties onto it next year. I'm fairly excited to be able to try my hand at grafting. What is CAC or COC? bloom also looks like MMD to me. how close and tight those blooms are. I know Home Depot Manila gets a bad rep, but the one I planted gives pretty good mangoes. Certainly way better than any Costco mangoes I've ever bought, and better than the few I've bought from Vons, Albertson's,... Interestingly, my friend just gave me some huge Keitt from a 99 Cent store, they were very yummny, sweet, hardly any fiber. Below is a photo of my HD Manila. Your fruit Look very nice NewGen but if you want tree growth I would suggest you remove all fruit for several years and let the tree develope foliage and a larger structure. Fruit Production on young Trees takes a lot of energy away from plant growth. Our growth rate hear in California is already slow enough and fruit production adds to the slowness. Here is a photo of my coconut cream mango tree that was grafted to a manila seedling tree in the summer of 2016. My manila, at the time of grafting, was probably about the size of your tree now with fruit on it but I did not let it set young and instead focused on growth. I will not let it fruit in 2019 either as my goal when the tree is young is maximum enlargement. Fruit quality will also be higher with a more mature tree. Yep, that's the plan for next year. Well, maybe I'll let it keep a couple fruits. those mangoes look ripe and ready. The last few I let them drop, and the taste was very good. I'm sure the orange ones in the photo are ready now, I just like to look at them hanging on the tree for a while longer, Lol. dont get caught short by critters beating you to it. It happened a lot to me. Thanks Behl, point taken. I have ground squirrels to worry about, have been able to trap a few.